GYO is a platform that seeks to support gamers and esports at all levels. We use the power of machine learning and artificial intelligence to support game and esports-enthusiasts of all levels. Receive automated coaching advice based on analysis of your play data, and get direct introductions to professional esports scouts worldwide. Follow your favorite esports stars and rising performers and dive deep into their statistics and play history. Support your young gamers by treating their gaming like organized sports by finding little league structures and college scholarship opportunities. 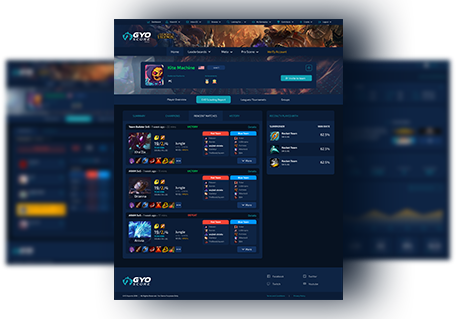 Use our organization, team management, and scouting tools to efficiently discover new players ready to join your recruiting pool or esports events. Join the Open Beta. It's Free! (Uhm.... those pictures don't look like me...)Still nope. Nailed it. GYO employs machine learning and artificial intelligence to dig deep and discover talent that lurks below the Top 100 of the leaderboard. We look for players that show exceptional judgement and skills, despite their win-loss record, and try to identify players with potential. We provide automated coaching advice and help them improve their game, storing their performance history over time so they can see real improvements. Trapped in ELO Hell? GYO can help you unlock your true potential. Believe it or not, the professional and collegiate esports scouts hate the leaderboards as much as you do. They struggle because in-game rankings don't truly reflect in-game skill, and many of the people they try to contact are not interested or smurf accounts. We ease this burden by providing them lists of players who have exactly the qualifications they seek, along with their stats history so they can begin tracking them. That could easily be you. By joining GYO, you are formally waving a flag in the air that says, "I'm here, and I'm trying to go pro!" That's half the battle. The other half is working on your own skills and continuing to grind until you show results, and we help you there too with automated coaching advice. Until now, nobody has had an answer for the question, "How do I go pro in esports?" Today, GYO is part of that answer. In addition to stats tracking, GYO is a league and tournament management and listing service. We gather league listings from around the globe and include them on our site to help players find new opportunities to test their skills in live competition. 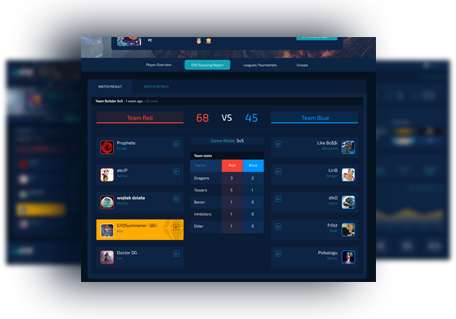 Where possible, we partner with the league and tournament organizers to automatically track and capture your stats, and compile them together into your profile. Let's forget about the pros for a second, most of us are just trying to game with friends, and even that can be a chore. With our Clan management tools, we allow you to invite friends and track each others play across multiple titles, not just one. For supported titles, we also automatically track stats and calculate performance amongst the clan members so that you can settle debates about who is the best in the clan. Schedule clan events and sessions and settle the score amongst friends. The HOTS news was a shock to everyone, and we want to help. Gyo was a dragon of Korean mythology who started as Imugis, or lesser dragons. Gyo, a mountain dragon, sought to ascend to become a full-fledged dragon, a yong or mireu, and with time, perserverance, and perhaps a bit of luck, eventually conquered his ascent. Many gamers today face a similar challenge. They believe they have the skills and perserverance to ascend the leaderboards and join the ranks of professional stardorm, but there is no support or guidance on how to conquer their quest. GYO is a platform built by gamers, for gamers, and seeks to help players with automated coaching advice, stats analysis, and introductions to professional coaches and scouts so that they can chase their dreams, conquer their own climb, and find success in the emerging esports world. We're just getting started. We hope you can join us. What data are you processing and providing to gamers? Our platform is a raw data computation platform. The raw data is statistics from matches played in various games worldwide. Using these data points, we analyze individual play performance using artificial intelligence engines capable of observing patterns of strong play when final results may not tell the whole story. Gamers provide us permission to access their play history, and we provide them with a deeper analytical understanding of how they perform in-game, and what their typical gaming profile is. They'll receive automated coaching, be able to track progress over time, and set benchmarks for themselves to try to improve against past performance. For those seeking to take their play to the next level, users can opt-in to provide gameplay data to professional esports organizations, esports scouts, universities with esports scholarships, and tournament organizers. These partners are then free to contact users directly if they would like to discuss offering a roster spot on their teams. How are you different than "_____"? There are many different scoring systems, tools, and analytics available within individual gaming ecosystems. 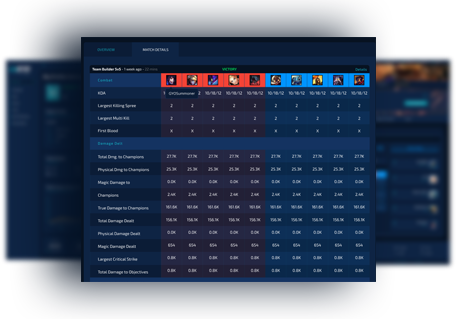 GYO seeks to provide deeper analytical processing that spans entire genres, game types, and role types so gamers can predict how their skills in one game today may translate to a future release. Many tools only provide summary information, such as data points averaged over time. We are building an artificial intelligence engine that takes our statistics much further, looking for unexpected paths and trends that may highlight high potential for improvement, not just current strength of play. Our platform allows players to discover themselves, then allow them to become discovered by others. In time, we will reveal more about our algorithms, but, to date, we have not found another source that is attempting to look at the available data in the same way we are. Yes! 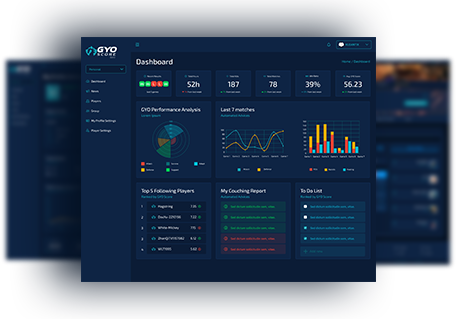 Sign up for a free GYO profile to receive a base statistical profile and access to dozens of tools for team management, recruitment, and league organization. A premium subscription will be available for gamers, parents, coaches, and esports organizations to unlock deeper analytics and management tools to help users reach new heights of success in the esports world.